Product code: ES3045 Categories: Sold Items, Sold Rings. There is nothing quite like the Art Deco era and nothing quite like the jewellery from this period such as this amazing 1920’s Art Deco era diamond ring that would suit any finger and make a superb Art Deco diamond engagement ring. Art Deco diamond rings have never gone out of style or fashion and thanks to the wonderful designs mean that any Art Deco diamond ring on your finger is sure to be admired. 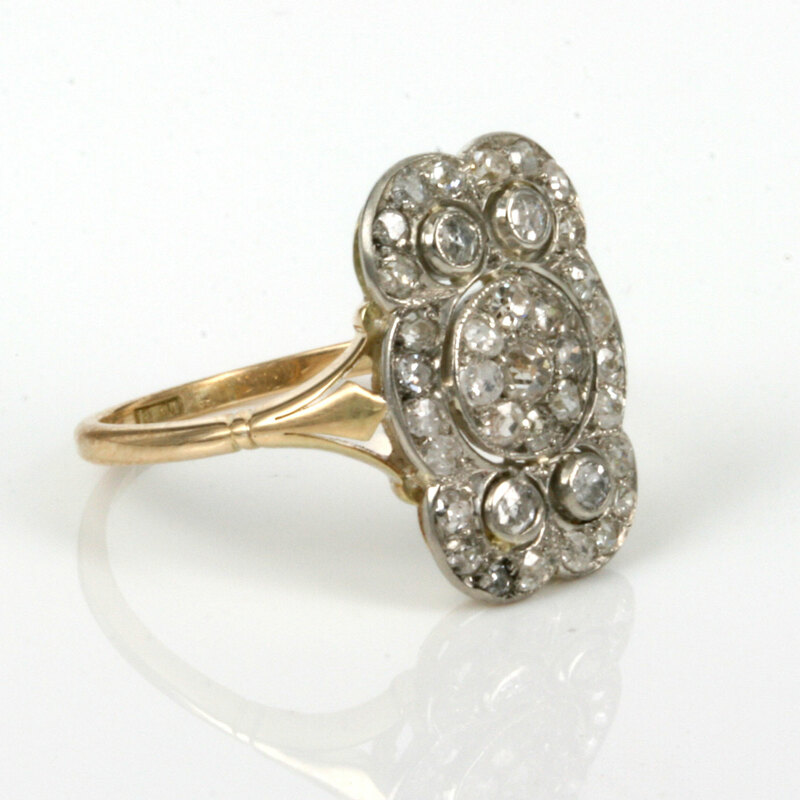 This Art Deco diamond ring was made in the early 1920’s and is all hand made in 18ct yellow and white gold and is set with a total of 37 diamonds in a stunning design. 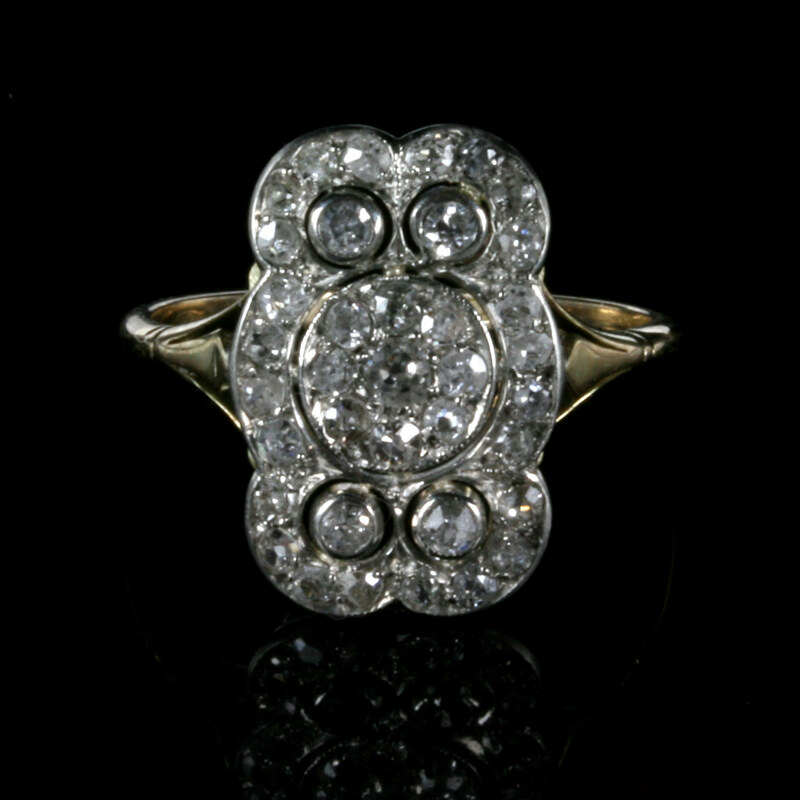 There is a centre cluster of diamonds with 1 diamond being surrounded by 8 more however like most Art Deco rings, it isn’t just about one design of a diamond cluster as the other 28 diamonds are set in such a magnificent way around the ring. The diamonds total 0.63 carats and sparkle magnificently. From top to bottom the ring measures 14.4mm and from left to right measures 11.7mm across and sits so nice and flat on the finger. Even the side of the band hasn’t gone untouched and has its own flair of the Art Deco era with not only split shoulders, but also that wonderful simple yet elegant angular design in the centre of the split. Art Deco diamond rings are always so unique and full of character and as mentioned before this diamond ring would make a superb example of an Art Deco diamond engagement ring and no matter the occasion or finger that this ring is worn on, it will always be admired and loved.